Is NPR Doing Too Many Stories About Catholicism? : NPR Public Editor Stories on the new Catholic liturgy prompted complaints that Catholicism is over-covered. Islam, Judaism and Christianity were in fact mentioned much more this year. A monthly average of three stories mentioning the denomination practiced by a quarter of all Americans doesn't seem out of line. 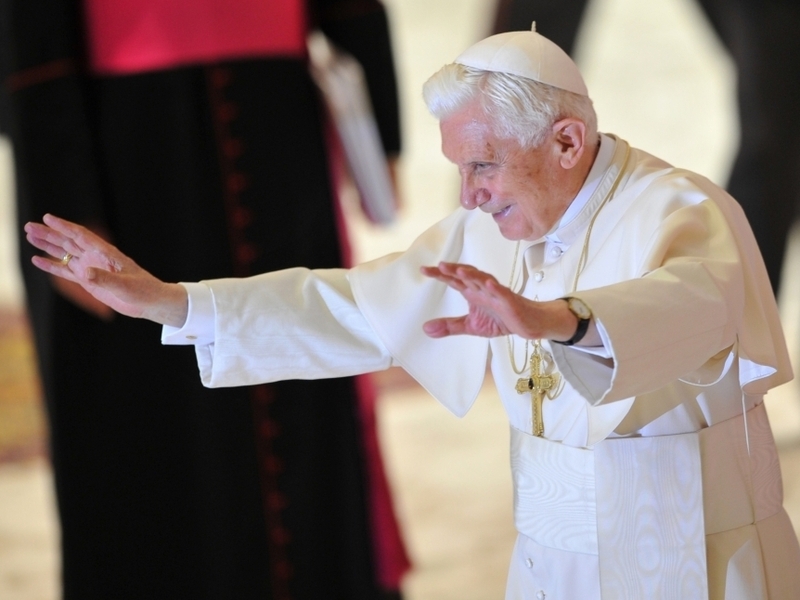 Pope Benedict XVI during his weekly general audience at the Vatican on Dec. 14, 2011. When the Catholic Church changed its liturgy in late November, All Things Considered, Weekend Edition, Morning Edition, and Tell Me More, covered the story. For some listeners that was way too much. "When anything is mentioned on NPR concerning religion, it seems that the only religion mentioned is the Catholic religion," wrote Jim Mundy of Green Cove Springs, FL. The reports led Ann Shropshire from Glenwood Springs, CO, to turn off the radio. "You keep running stories about how the Catholic Church has changed the mass. I do not believe that your listeners are a majority of Catholics," she wrote. The complaints brought me up short. I am used to complaints today about NPR's coverage related to Muslims, but to say that too much attention was being paid to Catholics seemed to harken back to another era and my youth in the South. Anti-Catholic sentiment was high then. I am myself Catholic, though it is more nominal than anything. I struggle with whether any religion makes sense, though I wish I could easily believe. I have experimented with Episcopalianism, Buddhism and Judaism. Regular readers of this column will know that my father was Jewish, as was my maternal grandfather. I say this in the interest of transparency, and because I suspect that some of the complaints come from people who are like me. Still, I recognize that religion is important in America and the world and that NPR should be covering it. Indeed, I love stories about religion and devour books on the subject. These numbers shouldn't be taken as bible. It's likely that some stories received multiple tags (i.e., Catholic AND Christianity, or Christianity AND Protestant). They also don't include NPR's hourly newscasts, which aren't transcribed and so aren't searchable even by NPR librarians. And the list mixes denominations, religions, and whatever you might call Protestantism today. But the numbers are still generally indicative of NPR's coverage. Islam is first for obvious reasons: It is so much a part of the news these days from the Middle East and South Asia. The same is true for Judaism and the Middle East. Mitt Romney probably has something to do with the number of stories concerning Mormons. Most Mormons identify as Christian, though not all Christians agree. Considering that there are approximately 1 billion Hindus in the world, just one story over a full year mentioning Hindus would seem to be a serious under-representation. But then, almost all of them are in India; relatively few are in the United States. The term "Protestant" once meant non-Roman Catholic in Western Europe and the United States, but it isn't a very specific identifier anymore. Six Protestant mentions on the NPR shows is surprising to me. The term has come to mean the older, shrinking mainline churches such as Episcopalian, Presbyterian and Methodist, and, arguably, the Amish. In general usage, "Protestant" doesn't describe the Evangelical, Pentecostal, and similar Christian churches. These as a group are now much larger than mainline churches in the U.S. So what do we make of the 39 Catholic mentions on NPR? Listener Shropshire is surely right that the majority of NPR listeners are not Catholic. NPR does not have statistics on the religious affiliation of its listeners, according to its Audience Insight and Research Department. But a Nielsen study this year concluded that nearly 19 percent of the visitors to the NPR website identified themselves as Catholic. That is an under-representation of Americans at large, perhaps because many Catholics are recently arrived immigrants who aren't online or don't read English-language sites like NPR's. According to the authoritative American Religious Identification Survey conducted by Trinity College in Hartford, CT, one in four Americans identified themselves as Catholic in 2008, the last year available. This also means that the Catholic church is the largest single denomination in the country. Because of its unity and hierarchy, moreover, its impact as a social and political force, as well as a spiritual one, is even more considerable. The church's huge network of universities, schools and charities are heavily involved in the intellectual, cultural and humanitarian direction of the country. This is in addition to the church's historical role at the root of Western culture. Moreover, the Catholic Church in recent years has been the subject of a great deal of news coverage, much of it unfavorable, from the sexual abuses by some priests to emotional battles over the closing of local churches. One could compare the number of stories about Catholicism with other denominations, atheism, humanitarian groups and the like, but I don't think the exercise would produce more than a lot of meaningless precision. To me, it comes down to a rough average of three stories a month mentioning a church to which at least a quarter of all Americans belong, and which is a force in national life. That hardly seems to me to be excessive, despite the numerous stories last month about the church's new liturgy. But religion, like politics, is one thing few people agree on and many people like to argue about. Please feel free to disagree with me.